I love the handle. I love what it's attached to. I love that other rusty thing, too! Just read David's comment. Funny. Rusty things are just great! Hope things have been going well for y'all. Hey Mindy....love your stuff! Somehow I signed on with my sons account...anyway this is Deidra with Girls Gone Junkin'. It always looks like you have soooo much fun collecting it all, just like Cathy and I do. We keep saying that we have to come see you in Athens. I promise we will get there soon! Amber Thomason is our hairdresser...she is great. Tell her the Girls Gone Junkin' sent you..her number is 972-955-6222. Have a great day! Oh, I love the handle. Looks like something I'd really like. I want to see the rest of the piece! 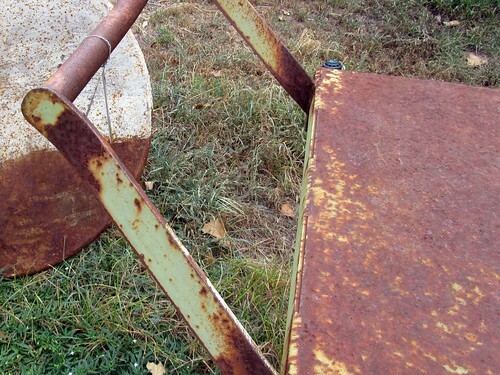 You can NEVER go wrong with rust... just sayin'. Is that handle connected to a cart? Is that your beverage cart for the show? I'm ready, girlfriend! David, honey. You are not rusty! Your knee creaks, but that's not rust. Tracy, good to hear from ya! I saw that g-baby bump on fb. Know you're excited! Deidra, thanks for the trip. I know right where she is! Sweet! Lanette, it's a wonderful piece. I can't decide if I want to sell it or keep it. I'm going to go for pricing it at a bazillion dollars and if it sells, oh well. MALisa, without question, the piece is not going to Zapp. It is heavier and bigger than anyone I know wants to deal with. Drinks in Poetry when you say so. k?